Quickstart, or deep dive, our user guide has got you covered. Get answers and share stories with the Epiphan community. Why is Epiphan LUMiO 12x the ideal choice over other cameras? 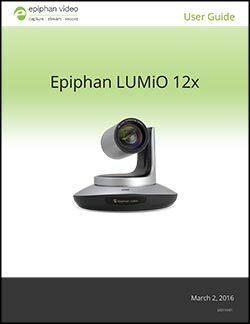 The Epiphan LUMiO 12x is a versatile and professional PTZ camera that is ideal for live event video capture with its 72.5° wide angle view, 12x optical zoom and simple operation via remote control. LUMiO 12x has been thoroughly tested by us to be the best fit for our flagship all-in-one live production mixer, Pearl. Other PTZ cameras work with Pearl too, but LUMiO 12x is the perfect match as its video outputs signals align with Pearl’s inputs and its 1080p 60fps output resolution and frame rate match up with Pearl’s input resolution capabilities. Why use LUMiO 12x over other kinds of cameras? LUMiO 12x covers more area with its pan, tilt and zoom functionality than traditional fixed cameras. PTZ cameras like LUMiO 12x are also more versatile than regular video cameras, allowing users to capture footage from a variety of angles and depths via presets on the remote control with minimal human involvement and technical knowledge required. Can I use more than one LUMiO 12x with Pearl? Definitely! Pearl can capture from up to 4 different HD sources. Can I control my LUMiO 12x from Pearl's Admin panel? This functionality is not supported at this time. Can I control my LUMiO 12x from a remote location? Yes. You can issue commands to your LUMiO 12x from a remote location via RS-232 serial communication using VISCA, PELCO-P and PELCO-D protocols. Can I control the interface of multiple cameras via daisy chain? Daisy chain functionality is not supported at this time. Can LUMiO 12x save video signals as a movie file? You need a separate capture appliance to capture and save your LUMiO 12x’s video, such as one of our portable video grabbers (AV.io HD, AV.io SDI, DVI2USB 3.0, or SDI2USB 3.0) – or our all-in-one live production switcher, Pearl-2. Where can I mount my LUMiO 12x? There are mount holes under LUMiO 12x’s base to allow you to secure your LUMiO 12x to a wall, ceiling, or tripod (mounting to a wall or ceiling requires a ceiling mount). The tripod mount hole accepts a 1/4″-20 UNC bolt. The rubber pads also located at the bottom of the camera allow you to securely place your LUMiO 12x on most flat surfaces. Does LUMiO 12x come with a remote control? 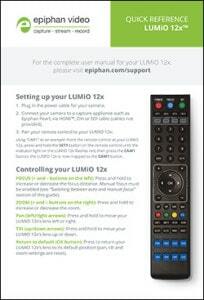 How many different LUMiO 12x cameras can the remote control support? 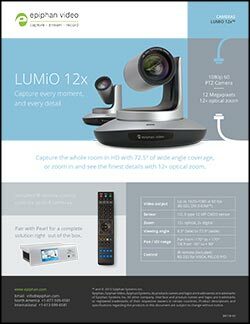 A single remote control can pair with up to 4 different LUMiO 12x cameras and control each camera separately. How many different presets can I save to the remote control? The remote control supports up to 128 different presets.